If receiving a box of Vanille Patisserie’s addictive macarons wasn’t fabulous enough, it’s now possible to have the treats custom-printed with a company logo or the initials of the gift recipient. Founded in 2002, Vanille Patisserie offers artisanal desserts and pastries, including mousse cakes, tarts, handmade chocolates and candies, freshly baked croissants, and of course, the popular macarons. Vanille has been recognized by Time Out magazine as one of the “16 Best Bakeries” in America. 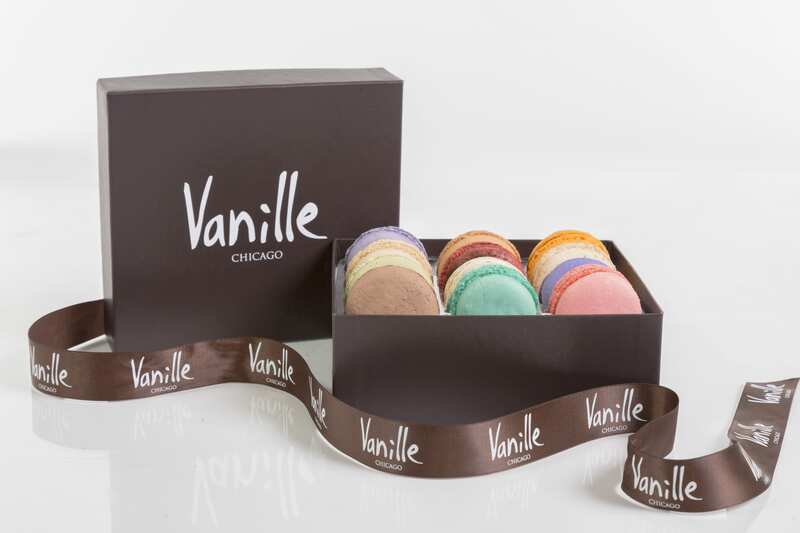 Vanille’s 12-piece macaron gift boxes are $35 and approximately $15 for shipping, depending on destination. A $25 set-up fee is required for customized logos or initials and all artwork must be supplied. Flavors can be selected individually or purchased as a standard assorted box. Current flavors include Caramel, Vanilla, Chocolate, Raspberry, Pistachio, Coconut, Coffee, Red Velvet, Hazelnut, Nutella, Cassis, Mango Passion, Rose, Lavender, and Green Tea. Custom-decorated macarons cost an additional $.50 per pastry. For more details or to order, please visit vanillepatisserie.com or call a patisserie specialist at 773-868-4574.